Half an hour before the opening of Takashi Murakami’s show at Gagosian Beverly Hills, the line of people waiting in the rain extended for an entire block. The Japanese artist has the standing of a pop celebrity. His exhibition GYATEI², on view to April 13, has most of the identifiable features that support such mass affection. For decades, he has done simple, brightly colored paintings of the chrysanthemum blossom, a motif of traditional Japanese art updated for contemporary viewers. 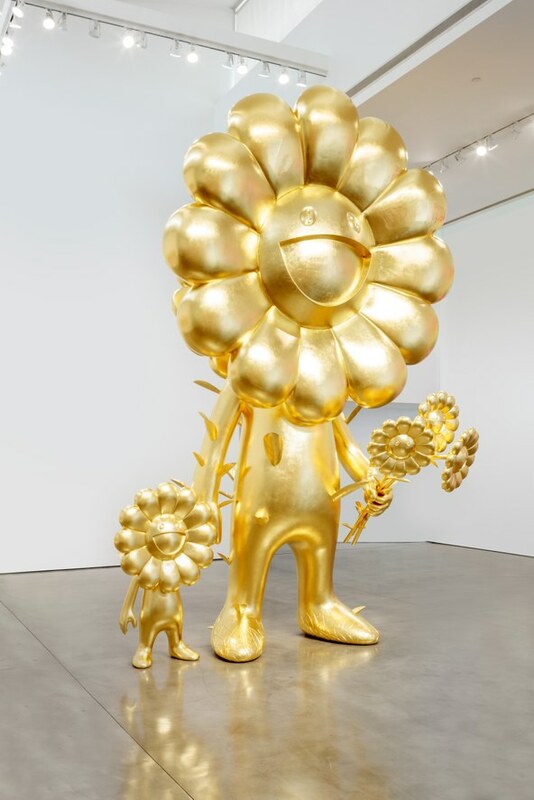 There are plenty of those sorts of paintings in the show, all recent, as well as a huge, gold-leafed, flower-headed figure holding the hand of a flower-headed child: Parent and Child (2018). In scale and sillyness, it packs quite a wallop. More gratifying, however, is the self-reflexion, even self-doubt, that permeates much of the other work in the show. 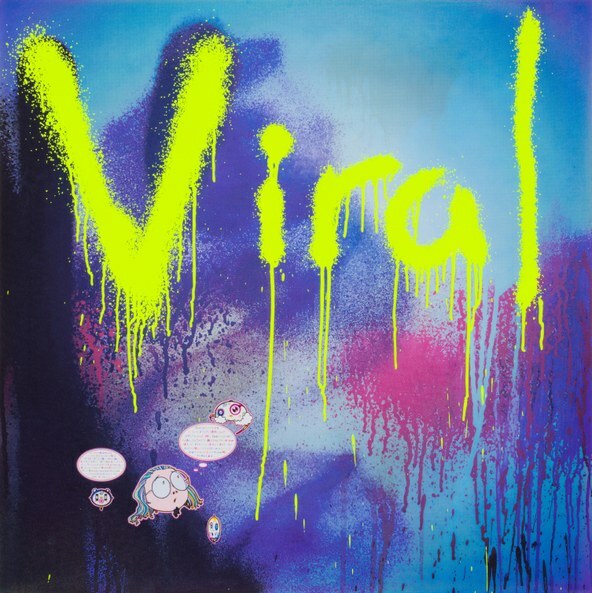 Murakami is a pioneer artist of the digital age, one of the first to successfully combine Western Pop art, Japanese anime and internet marketing strategies. He formed his Kaikai Kiki company to offer his art at the affordable level of a gift shop and as well as the rarified level of a seven-figure investment. Though based on Warhol’s embrace of business as art, Murakami further complicated the supposed lines between art and commerce, collaborating with Louis Vuitton and generating a scandal when the handbags were offered for sale at a boutique set up at MOCA for his first retrospective there in 2007. 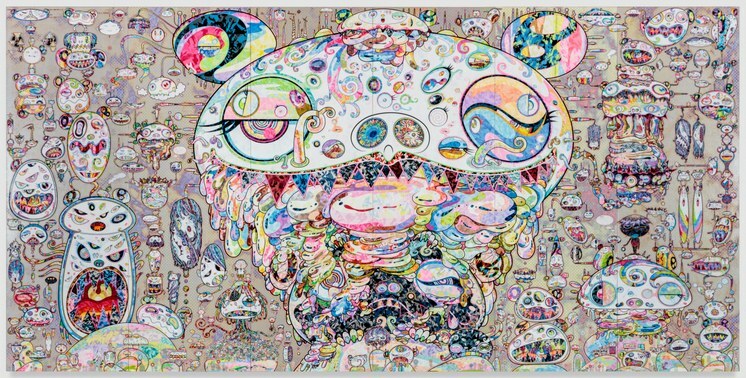 This could be pretty hollow stuff if Murakami’s art weren’t so wickedly layered and well considered. Several pieces in this show offer the higher spheres of contemplation. The show’s title, GYATEI², is the Buddhist mantra at the end of the Heart Sutra. Murakami’s work made a dramatic shift after the devastating 2011 earthquake, tsunami and damage to the Fukushima nuclear facility in Japan. Since then, his best work has included references to loss, transience and spiritual survival. Bodhisatvas and Arhats appear on their path to enlightenment, not in their cliched state of acceptance but anguished and wild-eyed. In addition to familiar flower faces, in this show there is the return of the manga-inspired Tan Tan Bo. One of the most spectacular paintings has a spectacular title: Tan Tan Bo a.k.a Gerotan: Having vomited five viscera and six bowels along with a lump of ego, he swallows them back into his empty stomach as everything disperses into the void; along the process he starts his journey into meditation (2018). This is one of his 21st century nods to the so-called Eccentrics, Edo period Japanese artists whose tales of seeking transcendence showed priests with snaggled teeth, long fingernails and unkempt hair. 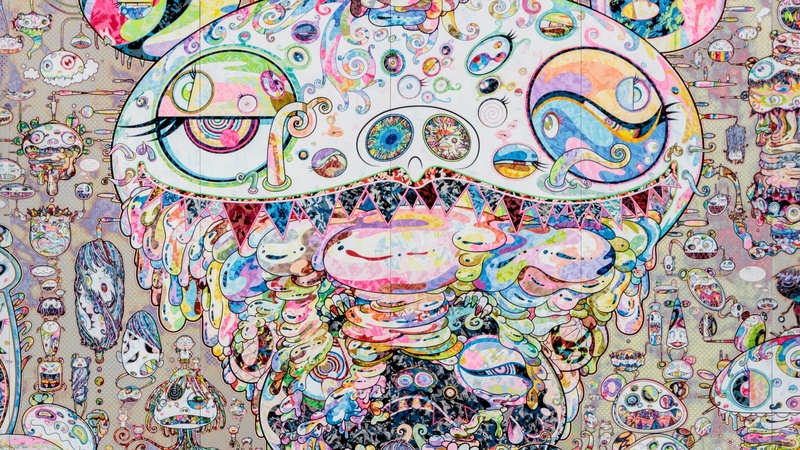 Murakami integrates these figures with the bouncy, goofy animated forms that define his art but there is no doubt about the seriousness of his message. A giant sea creature is perched atop a seabed of tiny skulls. The artist himself, in his typically comic appearance, stands a top the the creature accompanied by his devoted pup, Pom. Swirling all around are globular creatures with threatening eyes and pointy teeth as well as those looking frightened. These images are built up of layers and layers of colored and metallic paint and miniscule details. Other paintings have thought bubbles in tiny print with the artist’s musings about his own state of being and the foolishness of internet relationships. In Viral: And Yet the Earth Moves (2019), he apologizes to a future 50 years hence for wasting time on Instagram. Murakami, now 57, is highly educated in the history and techniques of traditional Japanese art, specifically the glorious Edo period. This exhibition includes a multi-panel 50 foot long painting that may be his magnum opus. Based on a piece of 14th-century blue and white porcelain, he spent over a decade finding ways to refine and expand the design using traditional lacquers, even brushed gold, but on a breathtaking scale. 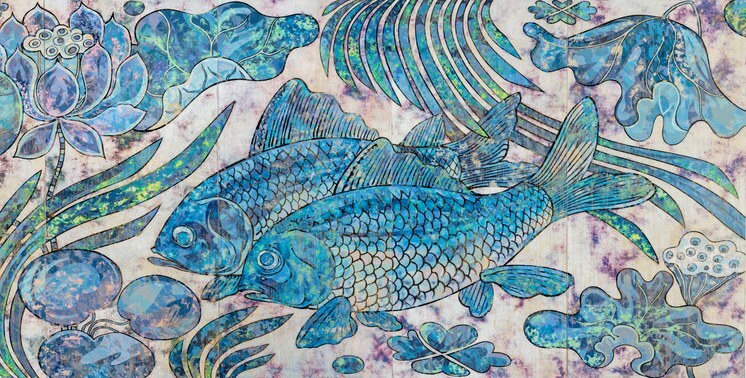 Giant blue carp cavort with arcs of waterplants. It is a work that is personal, reminding him of watching his father fish in a stream as well as seeing this extremely rare Chinese bowl in a museum. Murakami, the artist of the perpetual present, accesses that which enriches the most enduring art, a facility for immediate time travel to the art of the past and to the unknown future. That is worth waiting for.